Do I need to hire a guide for my Henry Mountains bison hunt? This is a difficult question to answer. Everyone is different in their hunting capabilities and physical condition. Your knowledge of the Henry Mountains and the behavior of the bison that live there is another factor to consider. The majority of people that draw a permit to hunt bison on the Henrys have been putting in for 20 plus years. Also consider that this is a once-in-a-lifetime hunt. You should take advantage of every possible factor that will help you harvest. Don’t leave any of it to chance. There is pride in completing a hunt DIY, but it is risky. Harvest rates for Henry Mountain bison hover around 75% for Hunter’s Choice, and 45% for Cow Only. Are you willing to bet against those odds? We have maintained 100% harvest rate for our clients, with decades of combined experience. Ultimately, if you have a slight inclination that you want to hire a guide, do it. Don’t hesitate and wait until the last minute when you’ve only got a few days left in the hunt. We usually will be booked already, and you’ll be burned out. Again, if you feel like you might want to hire a guide for your hunt, don’t hesitate. Book in advance. Will the bison be in the same spot during hunting season? I have rarely seen them stay in their summer range. If the bison are near their summer range come hunting season, they will move into the nearest road-less area. If you do get lucky and find bison in an easy area, you’ve got to be the first person to make a shot. Because as soon as the bison know they’re being shot at, they’ll run and never look back. Another thing people tend to forget is by the time the first Hunter’s Choice season opens at the beginning on November, there have already been numerous deer seasons that have already passed. Archery, Muzzleloader, Rifle, Management Buck. 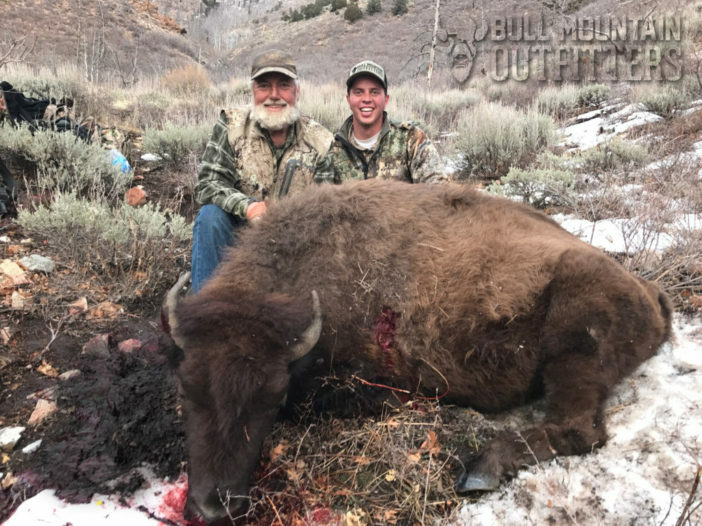 All of those seasons bring hunters and their groups around the bison that were in the easy access areas, which inevitably pushes the bison into their hideouts. So don’t think that just because you have the very first season Hunter’s Choice tag that the big bulls are going to be hanging out in the wide open. Again, there are exceptions to this, and some people do get lucky and harvest in an easily accessible spot. From what I’ve seen, only about 7%-10% of harvested bison on the Henrys are near a road. We have on few occasions harvested bison near their summer range. But probably 90% of our hunting occurs in the areas as far away from vehicle and ATV access as you can get. Summer scouting for bison on the Henrys will help you learn the mountain, which is beneficial. Just don’t go out there with the expectation of finding the bison in the same spot on your hunt. We know the areas where the bison hide. Our experience will give you the best opportunity to harvest a bison on the Henrys. Check back to our blog for more tips.